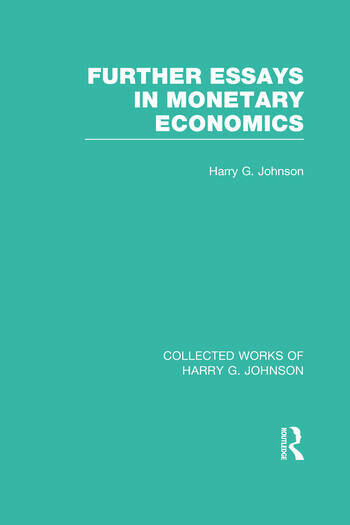 A sequel to Essays in Monetary Economics, this book develops the ideas on domestic and international monetary issues, with reference to specific events and crises of the 1960s and 70s. These essays are distinguished by the author’s expert grasp of the analytical techniques and contemporaneous policy problems of both domestic and international monetary economics. Introduction Part 1: General Monetary Theory 1. Recent Developments in Monetary Theory – A Commentary 2. The Keynesian Revolution and the Monetarist Counter-Revolution Appendix A: Keynes and the Keynesians Appendix B: Monetary Theory and Monetary Policy 3. Problems of Efficiency in Monetary Management 4. Inside Money, Outside Money, Income, Wealth and Welfare in Monetary Theory Appendix: A Comment on Pesek and Saving’s Theory of Money and Wealth 5. Is There an Optimal Money Supply? Part 2: International Monetary Theory 6. Some Aspects of the Theory of Economic Policy in a World of Capital Mobility 7. Theoretical Problems of the International Monetary System 8. The Case for Flexible Exchange Rates, 1969 Appendix: The Panamanian Monetary System 9. The Monetary Approach to Balance-of-Payments Theory 10. Five Notes 10.1. The Welfare Costs of Exchange Rate Stabilization 10.2. Seigniorage and the Social Saving from Substituting Credit for Commodity Money 10.3. Efficiency in International Money Supply 10.4. Border Taxes, Border Tax Adjustments, Comparative Advantage and the Balance of Payments (with Mel Krauss) 10.5. Are You Worth Your Weight in Gold? Part 3: The International Monetary Crisis 11. The International Monetary Crisis, 1969 12. Problems of European Monetary Union 13. Inflation: A ‘Monetarist’ View 14. Problems of Stabilization Policy in an Integrated World Economy 15. The International Monetary Crisis of 1971.